Do you know the song Drunken Sailor? Get that music in your head before you read any further. What do you do with a broken dryer, what do you do with a broken dryer, what do you do with a broken dryer, early in the morning?! Let it sit unfixed for months, let it sit unfixed for months, let it sit unfixed for months, early in the morning. Pull the clothes out of the washer, pull the clothes out of the washer, pull the clothes out of the washer, early in the morning. Hang ’em up outside to dry, hang ’em up outside to dry, hang ’em up outside to dry, early in the morning. Get real clever with how you hang ’em, get real clever with how you hang ’em, get real clever with how you hang ’em, early in the morning. That’s what we’ve done with a broken dryer, that’s what we’ve done with a broken dryer, that’s what we’ve done with a broken dryer, early in the morning. Are you getting the picture here? My dryer is broken. 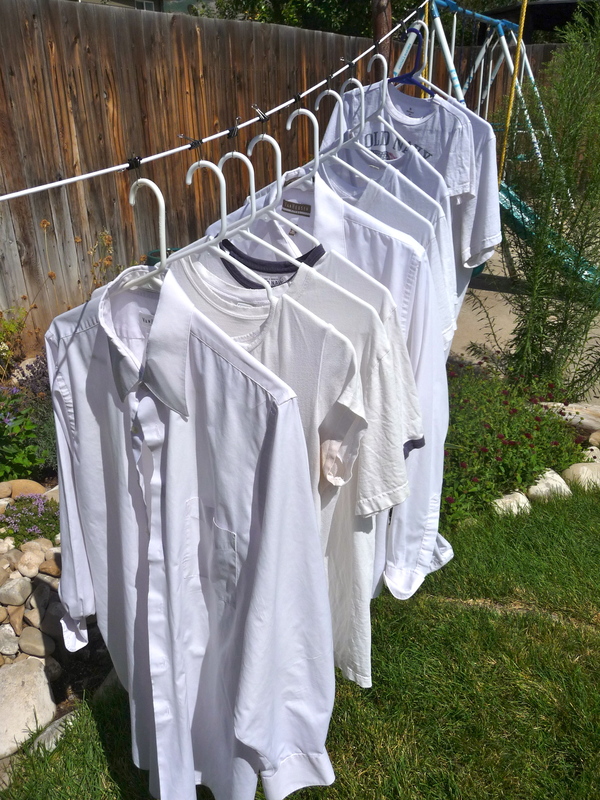 We’ve been hanging our clothes out on a clothesline for a couple of months now. We like to hang shirts on hangers so when they’re dry we can just hang them right up in the closet. And Curtis noticed that the shirts that were hung on hangers kept flying off the clothesline and ending up on the ground. Not so great when you’d like a clean shirt at the end of all this. So he came up with the idea to use binder clips to keep the hangers secure. And it works! 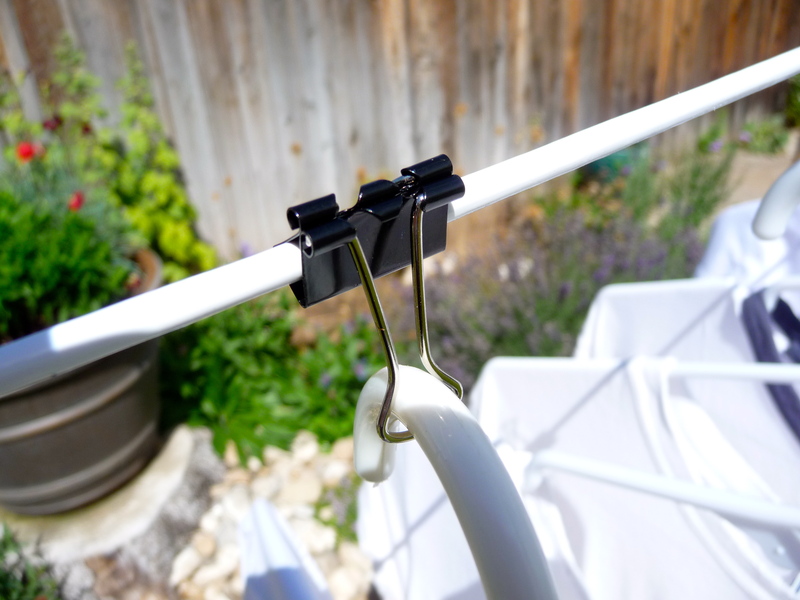 The hangers fit perfectly inside the binder clips and when hung, they provide just enough tension that the binder clips don’t slide around on the clothesline. Do any of you hang your clothes out to dry? What tips or tricks have worked for you? This entry was posted in Cleaning, Organizing and tagged broken dryer, closet, drunken sailor, hanging clothes, washer. Bookmark the permalink. Love it, and pinned it 🙂 Thanks for sharing! You’re welcome. That was very nice of you to pin it. Thanks!